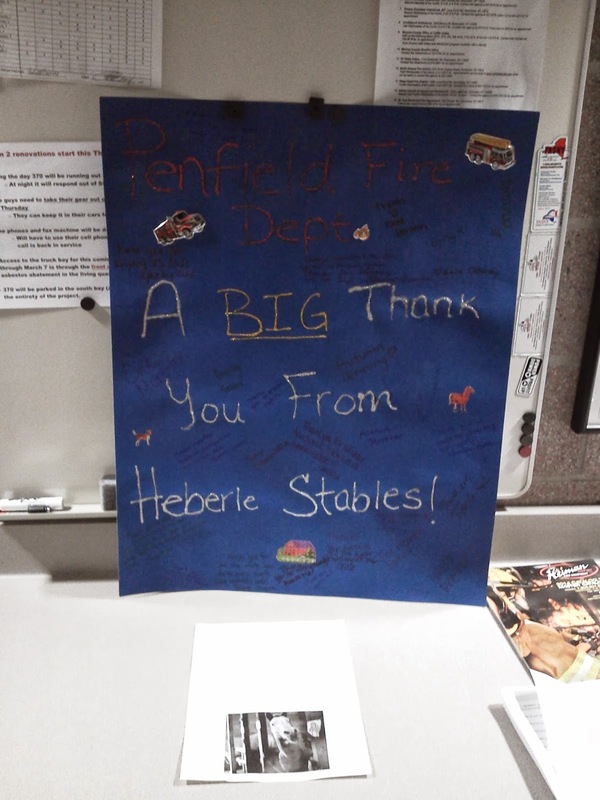 Penfield Fire received a Thank You the other day from the Heberles farm. The Heberles Horse Farm in the Brighton Fire district had a storage barn catch fire on March 3rd. Penfield fire was called to the scene as mutual aid to assist with the fire. Engine Company 373 was dispatched and ended up laying a 5 inch water supply line 1200 feet from the hydrant to the scene. 373 was flowing water out of the deck gun for several hours in the 5 degree temperatures that night. All 1200 feet of supply hose and 400 feet of attack lines were rolled up and taken back to the fire station to be repacked on the truck because it was to cold and frozen to do at the scene. Penfield Volunteer Firefighters were out just about 4 hours cleaning up and putting things back in service. We appreciate the note from Heberles and are humbled that they thought of us.